Dawood Ibrahim kaskar, son of a police officer, is India's most wanted man. He is boss of Mumbai-based organized crime syndicate D-Company, reputedly international drug trafficking, counterfeiting, weapons smuggling. He is declared a global terrorist by the U.S.
Dawood Ibrahim, the son of a police constable Ibrahim kaskar, was born in Mumka village in Ratnagiri in the Indian state of Maharashtra on December 26, 1955. He was brought up in Dongri, a poor of Central Bombay with a large but not exclusively Muslim population. Dawood Ibrahim is also known as Sheikh Dawood Hassan. He was the head of the organized crime syndicate D. Company in Mumbai. He was on the wanted list of Interpol for organized crime and counterfeiting as well as No.4 on the Forbes' World's Top 10 most dreaded criminals list of 2008. He was accused of heading a vast and sprawling illegal empire. After the 1993 Bombay bombings, which Ibrahim allegedly organized and financed, he became India's most wanted man. According to the United States, Ibrahim maintained close links with al-Qaida's Osama bin Laden. Hence, the United States declared Dawood Ibrahim a "global terrorist" In 2003 and pursued the matter before the United Nations in an attempt to freeze his assets around the world and crack down on his operations. The Bush administration imposed several sanctions on Ibrahim and his associates. Indian and Russian intelligence agencies pointed out Ibrahi's possible involvement in several other terror attacks, including the November 2008 Mumbai attacks. Pakistan denied any knowledge of his existence, Indian intelligence agencies, such as Research and Analysis Wing (RAW) belived that one of his addresses included White House, Near Saudi Mosque, Clifton, Karachi, Pakistan as per Interpol, and is provided protection, by Pakistan intelligence agencies, the Inter Services Intelligence (ISI). Siblings:- Brothers- Late Noor-ul-Haq alias Noora (allegedly shot dead by gangsters in karachi); Anees Ibrahim Kaskar; Iqbal Kaskar; a sister known as Aapi (reportedly 11 siblings, named of others not known). Mahrukh Ibrahim married Junaid Miandad, the son of a former Pakistan National Cricket Team captain, Javed Miandad. He reportedly had affairs with Pakistani actress Saba and Indian actress Mandakini from whom he also reportedly had a child. Dawood is a school-dropout from Ahmed Sailor High School in Nagpada in Bombay and started carrying out killings for the late Mumbai underworld don. Children:- Mahrook, 14 years: Mehreen, 12 years; Moin, 9 years; Maria, 3 years. Dawood initially started out as a mechanic on the streets of Bombay. As the pay wasn't good, he turned to crime full-time starting out as a smuggler. While some day that he also worked as a rickshaw puller in Azamgarh. With his friends and brothers, Dawood went down to the bustling Crawford Market and scammed gullible bargain hunters. Initially he did offer a customer an expensive foreign watch," After taking the money, he vanished, while the customer discovered that Dawood had switched the watch for a stone or some such worthless object during the wrapping." By this late teens, Ibrahim created D-Company (his own gang). He was charged with murder as a result of his audacious bid to destroy the near monopoly enjoyed in the underworld by the competing Lala clan. D-Company emerged victorious after an intense period of blood-letting, however Ibrahim was forced to flee his beloved Bombay. Some say that he had begun his real criminal career in Mumbai working for the Karim Lala gang (which later became his own gang's rival) exploiting the rapid expansion in the Bombay (now Mumbai) to industry advantage, while according to some, he began his criminal career working as a career for smuggler Haji Mastan. Later on, he split from both of them and started his own gang, D-Company. He soon moved his residence to Dubai in the United Arab Emirates (UAE) where the continued to have business interests alongside India. He became one of the Mumbai's gangsters, with Karim Lala and Varadarajan Mudaliar as his seniors, soon he superseded all within a period of just five years- between 1983 and 1988. In view of his power, even the aged don Karim Lala had to go all the way to Mecca (KSA) to sign a truce with him. Soon he came into contact with the Pakistan Inter Services Intelligence (ISI) wing. The two shared a couple of interests. The ISI wanted a person who could foment communal trouble whenever the need arose. Dawood wanted his piece of action in the territory and an understanding was therefore reached. The ISI allegedly helped Dawood to flourish. The gold-runner became a mafia don and his gang same to be known as D-Company in Mumbai. 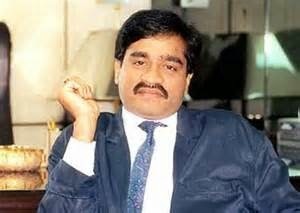 Dawood put his finger in every pie-from real estate to film production- and thought himself to be above the law. Late Amarjit Singh Samra, the former Mumbai Commissioner of Police said about Dawood's spectacular rise: "In 10 years, this ordinary-looking son of a police head constable had became, virtually, omnipresent in any crime." Dawood's elevation to the status of The Don was made by the late Ramabhai Naik, the latter in 1986 gunned down supari-king Karim Lala's nephew, the dreaded Samed khan and paved the way for Dawood Ibrahim to become the undisputed don of the Mumbai underworld. Ironically, Rama Naik was killed in an 'encounter' with Nagpada police PSI Rajan Katdhare in 1988. Another version is that Dawood used a Kashmiri woman, Nassem, to lure Samad Khan to an old building and then got him killed by his own gang comprising of Chhota Rajan, Sanjay Ruggad, Dilip Bhuva and Sunil Sawant alias Sauthya and thus got elevated to the position of the Don of Bombay. Thereafter, he shifted his base to Dubai (UAE) in 1986 and established chains of businesses in partnership with local Sheikhs. He rubbed shoulders with kings and princes of the Gulf emirates and acquired more power and hence could save himself from being extradited to India. Dawood Ibrahim is believed to control much of the 'Hawala' system, an unofficial system for transferring money and remittances outside the view of official agencies, mainly proceeds from narcotics trafficking and illegal business dealings. Much of the organization's operations are in India. Bombay Blastings :- Ibrahim is widely believed to have masterminded the 1993 Bombay Bombings, a series of terrorist attacks carried out in the city on March 12 of the year. In 2003, the Indian and the U.S. government declared Ibrahim a "Global Terrorist". Ibrahim is on India's "Most wanted List". The United States Department of Treasury has also designated Ibrahim as a terrorist as part of its international sanctions program. The departmental of Treasury maintains a fact sheet on Ibrahim that contains reports of his syndicate having smuggling rules from South Asia, the Middle-East and Africa shared with the used by terrorist organization al-Qaeda. It is revealed by the fact sheet that Ibrahim's syndicate is involved in large scale shipment of narcotics in the United Kingdom and Western Europe. He is also believed to have contacts with al-Qaeda leader Osama bin-laden. In the late 1990s, Ibrahim travelled in Afghanistan under the Taliban's protection. The syndicate has ever been to destabilize the Indian government through riots, terrorism and civil disobedience. Washington added that they will request the United Nations to list Ibrahim "in pursuance of relevant Security Council resolutions". The UN listing would require all UN member states to freeze Ibrahim's assets and impose a travel ban. Ibrahim is also suspected to have connections with terrorist organizations , and in 2002 was linked to the financing of increasing attacks in Gujarat by Lashkar-e-Toiba. New Delhi handed over to Islamabad a list of 38 most wanted criminals, including Ibrahim. In January 2002, a month after the parliament attack, Indian officials had meetings with Colin Powell and Condoleezza Rice in the U.S.A list of the Top 20 most-wanted terrorists in Pakistan was handled to the US. Ibrahim was wanted in connection with the 1993 Mumbai serial blasts. Ajmal Amir Kasab, a guman arrested for participation in the November 2008 Mumbai attacks that killed 173 inclusive of 164 civilians and security personnel and 9 terrorists, confessed to authorities according to reports that Ibrahim's organization provided arms and explosives to the Lashkar-e-toiba group that were used to carry out the attacks. The past few years have seen a dramatic decline in Dawood's fortunes from the heady heights of the life depicted in "Portrait of a Don". One of the main reasons that contributed to his called decline is the assassination of Shared Shetty, Dawood's financier and long term confident, carried out by Dawood's long time rival Chotta Rajan. News media outlets reported the murder as a sign of a dramatic shift of power between the crime lords. The loss of Shetty was the followed by the declaration by the United States Treasury Department declaring Ibrahim a global terrorist because of his links with Osama bin laden. Ibrahim then lost one of his closest aides, Pakistani Underworld Don Shoaib Khan in 2005. Another major blow was given to Ibrahim by the arrest of ten members of his gang by Mumbai Crime Branch on November 21, 2006. They were extradited from the United Arab Emirates, from reported in India Today that Dawood Ibrahim provided the logistics for the November 2008 Mumbai attacks. In June 2009, his brother and close associate Anees Ibrahim was shot dead In June.